3 bedroom, 2 bathroom condo that sleeps 6 people. Great views from the balcony! Spanish Main provides a GREAT VIEW of the BEACH & POOL with the convenience of walking to Downtown Cocoa Beach that has restaurants and shops. 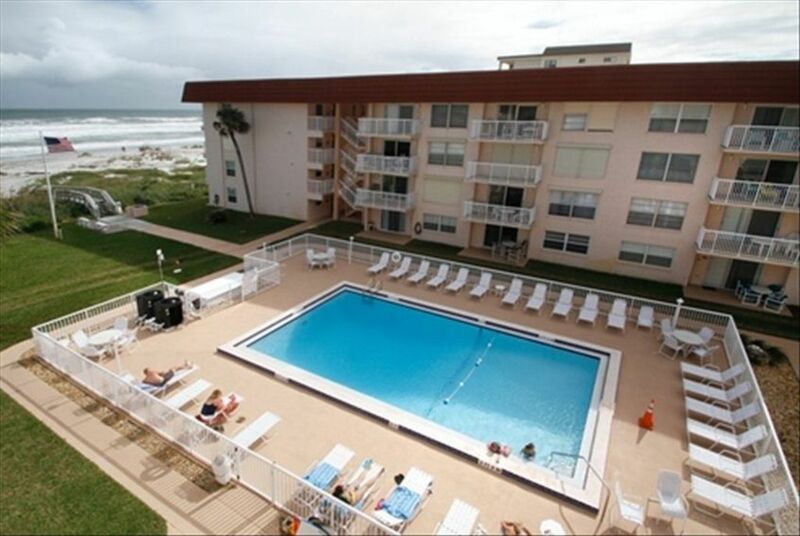 Located in Central Cocoa Beach, this FAMILY FRIENDLY Condo overlooks the well-maintained pool and beach. Located on the 4th floor, experience the view from the balcony and listen to the waves. Master bedroom has KING SIZE BED and private bath. Bedroom #2 has DOUBLE TWIN BEDS. Bedroom #3 has QUEEN BED. The living room has been updated with beautiful tile flooring and a leather sectional. Kitchen has BREAKFAST BAR and opens to adjacent dining room and living room. Living room opens to private furnished patio which overlooks POOL and BEACH. Spanish Main is located WITHIN WALKING DISTANCE OF GROCERY STORE AND MANY RESTAURANTS in downtown Cocoa Beach. No pets please. Enjoy the comfort of a well-maintained property. The owners continue to visit and update their property. This is one of the Cocoa Beach Best favorites! Good location. Pool was fine. The 4th floor condo faces south, which is nice in the winter time. The interior showed some age. No disposal for the sink, minimal kitchen utensils. It wasn't terribly expensive, so this is not really unexpected. Rooms were ok. Bathrooms small. Balcony is small. Not bad, just nothing special to recommend it. A great place. Close to good restaurants an short walk on the beach to Coconuts on the beach. Loved the place. Don’t read the rules and worry. Keep the place clean and be reasonable and all is good. The management was fantastic. We had a few small problems ( needed another parking pass and a tv was broken) they fixed it right away. We loved the place a great view of the beach and the pool. So close to everything you need or want. If you don’t want to drive you can walk or Uber was so quick. We stayed over New Years and had a great time. Don’t think your taking next year I am LOL. plan on bringing what you need in food and drinks they have everything else you can need, pool and beach toys and chairs, a coffee maker, pots and pans and a washer and dryer ( so convenient). Go and enjoy yourself you can’t beat the price for the amenities. We had a wonderful time in Cocoa Beach! This property was well maintained and met our needs. Great view from our room of the ocean and pool area. Would stay at this condo again! Thanks for the great review and being awesome guests. No lock on patio door so we could not lock it when we we're out and payed service fee meaning cleaning o.k. have stayed in a lots of condo rentals and I understand there are a few things you need to do before you have leave. It seems that we had clean everything up. There is a notes on the refrigerator out lining everything to be done before you leave and it was a page long and anything you don't do or don't do right it's $50.00 fine for each one. The place is kinda old but nice and we did enjoy being there. Forgot there's no TV channel guide list and the remotes gave us fit's. Thanks for taking the time to write a review. It is only through the feedback from our tenants that we are able to make our properties the best that they can be. The issues that concerned you have been addressed, and we hope that you decide to stay with us again, so you can enjoy these improvements. Beautiful, spacious condo right on the beach! This place has plenty of space for 6 people! Comes with all of the necessities, whether you’re looking to cook in the kitchen or take the boogie boards down to the beach, they’ve got you covered! Check in, check out instructions very clear. Would definitely stay again when in the area! Thank you for the great review. We enjoyed having you and your family as guests. Walking to Downtown Cocoa Beach to enjoy drinks or dinner. Also the world famous Ron Jon's Surf Shop is just minutes away. Watch the cruise ships depart at Port Canaveral, just 5 miles to the north. The casino cruises set sail several times a day and offer free food and drinks.